Africa has been well represented at the fourth edition of the London International Documentary Festival. Two pieces about the Sahara region have been shown: Toumast: Guitars and Kalashnikovs and The Death of the Gazelle. 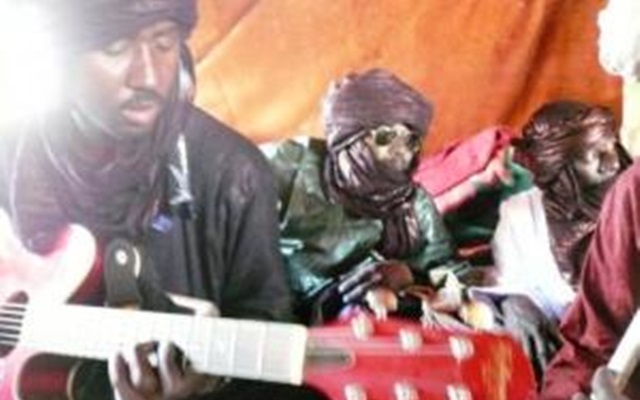 Toumast: Guitars and Kalashnikovs presents an adventure amidst the Tuareg rebellion, halfway through music and violence. Has a state the right to massacre just because it has power? Moussa Ag Keina, leader of the music group Toumast, wonders. Here is a question that perfectly illustrates the context of Dominique Margot’s documentary. Since the decolonisation, the Tuaregs have been the victims of a crisis ravaging their community. Scattered among several countries and their artificial borders, they have been denied all aspirations for autonomy and equal rights. Some of them thus decided to take up arms and fight the oppression from the central governments; Moussa was one of them. After numerous bloodsheds and a few non-respected peace agreements, Moussa eventually chose to fight with a new weapon: music. It is now with the help of his guitar that he expresses his people's misery. That is the story of Toumast. The documentary takes us on a journey in the middle of the Sahara desert, from the fighters of the Aïr Mountain, in Niger, to the Malian city of Kidal where we also discover the female music band, Tilwat. Women are equal to men in the Tuareg society, and as Aminatou Goumar, the other member of Toumast, asserts, Tuareg music cannot be done without women. As a bonus, Margot offers a few scenes from the recording sessions of their latest album, Amachal, as well as some concerts footage at the festival Vieilles Charrues in Brittany, and in Moussa’s hometown in Niger. Toumast: Guitars and Kalashnikovs is a documentary not to be missed, whether for the beauty of the Tuareg music, or to understand the issues in the Saharan region. A few days later The Death of the Gazelle by Jérémie Reichenbach was screened at the Free Word Center, exposing a few days in the lives of young Nigerien fighters. Jérémie Reichenbach can be considered as a specialist of the Saharan region since his first of many trips to Niger in the 90s. This new project reflects his experience, and brings a different viewpoint from Teshumara, his previous work on the subject. This short documentary focuses on the daily lives of the young Nigerien combatants for justice. Far from bloody warfare, the soldiers enjoy their ritual tea, listen to the news on old radios, or also chit chat around a campfire. For forty-five minutes, the viewers are transported into the shoes of these young men, and discover what it means to be a fighter when you are twenty. This approach is likely to deter a few, especially those expecting a romantic tale about the warriors of the desert. But despite some overlong parts, Reichenbach’s realistic angle can only be applauded. The Death of the Gazelle is in the end the death of innocence, of this youth sacrificed for interests that go beyond them. Thanks to the work of directors like Dominique Margot or Jérémie Reichenbach, the Tuareg cause will continue to make its way to the rest of the world.